North Carolina Central didn’t win its first NCAA Tournament game on Wednesday, but it did show why the program is a success. North Carolina Central won’t return back home with a win, but it doesn’t mean its NCAA Tournament run was a failure. NCCU lost a five point lead late in the second half, allowing North Dakota State to come away with a 78-74 win. The loss was tough, especially for the NCCU seniors who once again saw their season end in a heart-wrenching defeat in a First Four matchup. 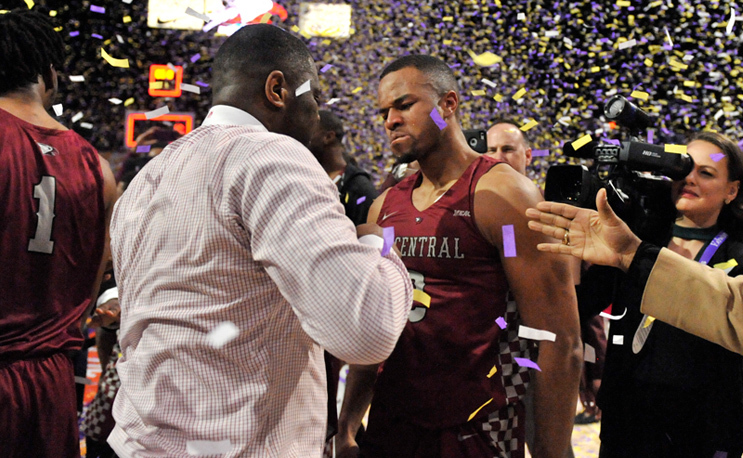 NCCU received a valiant effort from seniors Larry McKnight and Raseean Davis. McKnight sparked the team in the second half with his three-point shooting and an emphatic dunk, scoring 15 of his 20 points in the last 20 minutes. Davis had another huge game with 20 points and 16 rebounds, putting up an outstanding performance in his final game in the Maroon and Gray. The usually poker-faced LeVelle Moton couldn’t hide his emotions when talking about a senior class that he’s obviously very fond of. During his post game press conference he said the aftermath of his team’s loss reminded him of something his grandmother told him. A transparent and candid Moton said his players had become his children. “And you love them. And just like anything for your kids you don’t want to see them hurting. And just the mere fact that it’s their last game and I had the opportunity to help them through that — and I don’t know if I did my very best. And they’re questioning if they did their very best. You just don’t want them to hurt. Family is often used as a cliche in sports, but the NCCU program has become about as close as you can get during Moton’s watch. By now you’ve seen how emotional his son VJ got during senior night. But it’s not just viral moments. When the team won the championship on Saturday, he thanked sports information director Kyle Serba, who has been in his position since Moton was a student-athlete back in the 1990s. When they returned to Durham with an NCAA bid in their back pocket, he thanked the young lady who cleans his dry-erase board. This season marked the fourth time in six seasons that NCCU has appeared in the NCAA Tournament in just its first decade as a Division I school. That’s remarkable given the short time span, limited resources and the fact that even in D2 it was not a national power. Despite winning the 1989 D2 national title, NCCU hadn’t won a conference championship since it won the CIAA crown back in the 1950s before breaking through in 2014. Undoubtedly, the family bond will be tested once again this spring as Moton will surely be on the list for several jobs outside of Durham. Rumors have him moving elsewhere in the Carolinas, but we’ve heard that story before. No matter what happens going forward, and despite the lack of an NCAA win, the Eagles’ recent success is one of the best success stories in college basketball.